"I make the dough on Saturday night, and shape the rolls on Sunday morning. The rolls rise while I am at church, and are ready to pop into the oven for Sunday dinner." In another bowl, beat eggs in 1 cup warm water; add oil and salt. Mix egg mixture into yeast, and add sugar. Gradually add flour. Cover with a damp cloth, and allow to stand at room temperature for 1 hour, then place in the refrigerator and allow to rise overnight. This dough is rather sticky, and will raise to at least twice it's size. These were easy to make, but were on the heavy side when finished. I served them straight from the oven. While the flavor was nice, I will not serve them again because of the heaviness. These were the most delicous light and fluffy rolls I have ever tasted. Was very easy to make. 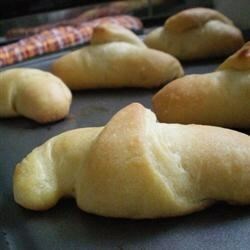 I was given several recipes for rolls and they NEVER turned out as good as these. I love this recipe so much and haave shared it with several friends!